License: US$0.99 – Universal App. Compatible with iPhone, iPod touch, and iPad. Requires iOS 4.3 or later. This app is optimized for iPhone 5. 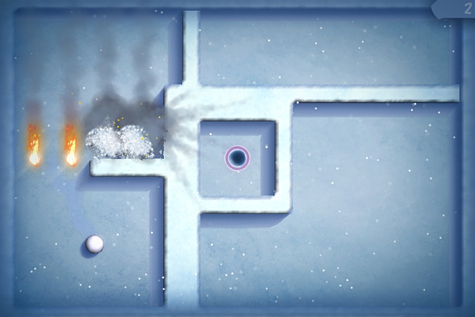 If you like fluffy snow balls and maze games, then you are going to love Look Out – Blizzard. You assume the role of the defenseless little snowball and it is your aim to guide it to safety. Sounds simple enough, doesn’t it? It would be, if it were not for fireballs and electrified obstacles doing their best to prevent you from succeeding. Not to mention droplets of water that will have you slipping everywhere, and rocks that will slow you down. 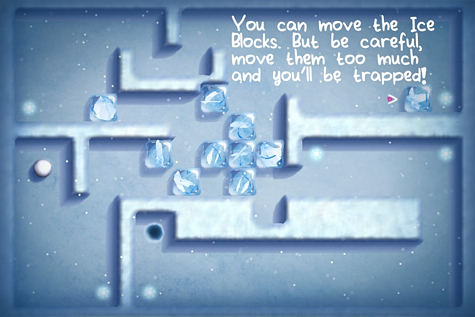 As you advance through the maze levels, the difficulty increases and even seasoned gamers will find they get stuck moving their little snowball careful through the maze. Besides the 60 maze levels, you also have a survival mode and a multiplayer online gaming capability for up to four players via Game Center. The controls are interesting but also flawed. 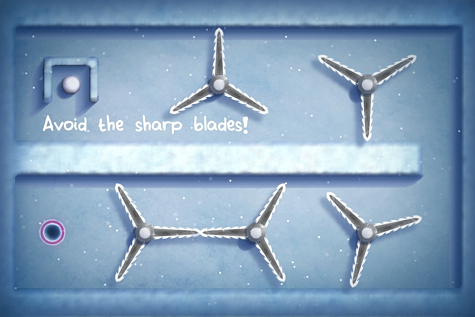 You will move your snowball around the virtual maze by tilting your device left to right, and forwards and backwards. You will notice I didn’t say up or down. That is because there is no way to play Look Out – Blizzard unless you use your device in a flat horizontal manner. Despite this control limitation, when you get into a game, the controls are functional and fluid. You will need to have a steady hand though, as the smallest movement could have you running off course and into harm’s way. Each game is played with speed in mind. Complete the maze as quickly as possible and you will be awarded a series of stars. The more stars you collect, the better ranked you will be on Game Center. Besides obvious rankings against friends, there are a number of achievements to aspire to, as well as challenging others in a race to get the highest score. The background audio has a repetitive electric guitar soundtrack that I personally enjoyed and felt appealed to the edge of your seat excitement that the game delivers. The graphics are beautifully rendered, and events such as a collision explosion with a fireball gives not only an audible and visual explosion, but your device will physically vibrate. This all adds to the immersion and excitement of the game. Throughout testing I experienced no dropped frames. Overall, the game is a fantastic experience from start to finish. It would be nice to see alternative controls so you could control the cute little snowball while reclining in bed, for example. For now you are limited to looking down at your device, from a birds eye view, in order to play the game. If you would like to try before you buy, the developer has released a free version of the game alongside the paid version. I’m sure you will agree that the paid version with 60 levels to work through is worthy of the US$0.99 outlay. I am awarding Look Out – Blizzard a MyMac.com rating of 7 out of 10.